How Spanish-language radio has influenced American and Latino discourse on key current affairs issues such as citizenship and immigration. The last two decades have produced continued Latino population growth, and marked shifts in both communications and immigration policy. Since the 1990s, Spanish- language radio has dethroned English-language radio stations in major cities across the United States, taking over the number one spot in Los Angeles, Houston, Miami, and New York City. 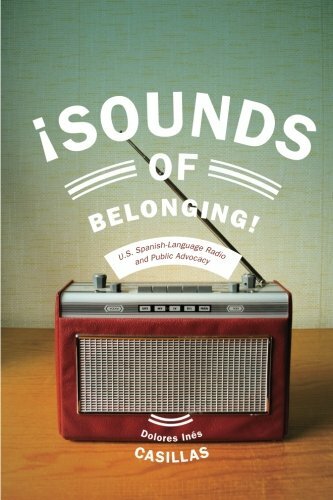 Investigating the cultural and political history of U.S. Spanish-language broadcasts throughout the twentieth century, Sounds of Belonging reveals how these changes have helped Spanish-language radio secure its dominance in the major U.S. radio markets. Bringing together theories on the immigration experience with sound and radio studies, Dolores Inés Casillas documents how Latinos form listening relationships with Spanish-language radio programming. Using a vast array of sources, from print culture and industry journals to sound archives of radio programming, she reflects on institutional growth, the evolution of programming genres, and reception by the radio industry and listeners to map the trajectory of Spanish-language radio, from its grassroots origins to the current corporate-sponsored business it has become. Casillas focuses on Latinos’ use of Spanish-language radio to help navigate their immigrant experiences with U.S. institutions, for example in broadcasting discussions about immigration policies while providing anonymity for a legally vulnerable listenership. Sounds of Belonging proposes that debates of citizenship are not always formal personal appeals but a collective experience heard loudly through broadcast radio. View More In Media & the Law. If you have any questions about this product by NYU Press, contact us by completing and submitting the form below. If you are looking for a specif part number, please include it with your message.